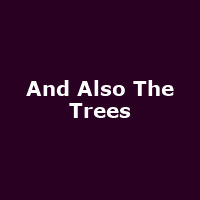 And Also the Trees are an English post-punk band, formed in 1979. The and features founder members, singer Simon Huw Jones and guitarist Justin Jones. Releases include their 1984 eponymous debut, plus "Virus Meadow" (1986), "The Millpond Years" (1988), "Farewell to the Shade" (1989), "Green Is the Sea" (1992), "The Klaxon" (1993), "Angelfish" (1996), "Silver Soul" (1998), "Further from the Truth" (2003), "(Listen For), " The Rag and Bone Man" (2007), "When the Rains Come" (2009), "Driftwood" (2011) and 2012's "Hunter Not the Hunted" (2012).